Before I get into my mini-review of Ryan Adams’ show in Berkeley on Tuesday night, I should state a few facts for the record about my almost-relationship with Ryan Adams. Forgive me in advance for the indulgence — I need to get a few things out of the way. One night in the summer of 1995, I had nothing to do one night and my friend David Menconi invited me out to see a band in Raleigh that I had never heard of and really didn’t care about (I think it was this show — only their 7th outing). 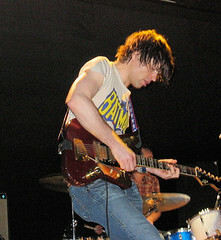 The band was fronted by Ryan Adams, who I only knew as a guy who played in the Patty Duke Syndrome, a local punk rock band. The transition to “alt-country” didn’t make sense to me, but Ryan explained it in the first Whiskeytown 7-inch, “Angels are Messengers from God”: I started this damn country band / ‘cuz punk rock was too hard to sing. I first encountered this 7-inch when I did the 2-5am Monday morning shift at WXDU (I followed the much-more-lively Sunday night 11pm-2am hip-hop show, and I always felt like I was breaking up a party when I arrived for my shift and segued over to my set. Well, ok, I actually was breaking up a party every time). I came this close to having Whiskeytown play a house-warming party in my backyard when I lived in Raleigh in 1995. Tenuous connection #345: My favorite band while I was in Raleigh (in the era of Superchunk, Archers of Loaf, et. al.) was Picasso Trigger. Lisa Cooper, the guitarist, became a good friend of mine when we found ourselves washing dishes and delivering pizzas at the same suburban Pizza Hut (see #2 in “Five things you don’t know about me“). I had a major punk rock crush on Kathy Poindexter, the lead singer of Picasso Trigger. I think Ryan did, too: he wrote “Lo-fi Tennessee Mountain Angel” for her. (side note: John, the drummer from Picasso Trigger at the time, made it on “The Price is Right” shortly after I left NC. I helped him change the tire on his van once. Another brush with fame.) Lisa Cooper, if you are out there, email me! The last time I saw you, we ended up a party in Atlanta and the Indigo Girls showed up. Decidedly not punk rock. Aside from his engagement with the audience, this was a great show, plain and simple. The band was ridiculously tight without seeming at all mechanical, and I felt that sense of amazement that you only feel at a Great Rock Show. All I can say is: wow. Ryan is a certified Rock Star. Next Post 2nd anniversary at Yahoo! Utterly amazing show on Tuesday! Thank you Chad, Ryan, and The Cardinals! Loved the show! Chad, thanks for the review. It’s too bad he didn’t play magnolia mountain or Rip off. Love you Ryan!